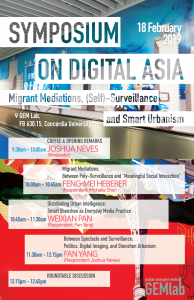 About the event: Please join us for a one-day symposium on the theme Digital Asia, with invited speakers Feng-Mei Heberer (New York University) and Fan Yang (University of Maryland, Baltimore County), as well as Concordia’s Joshua Neves (CRC in Global Emergent Media) and Weixian Pan (PhD Candidate, Film Studies). 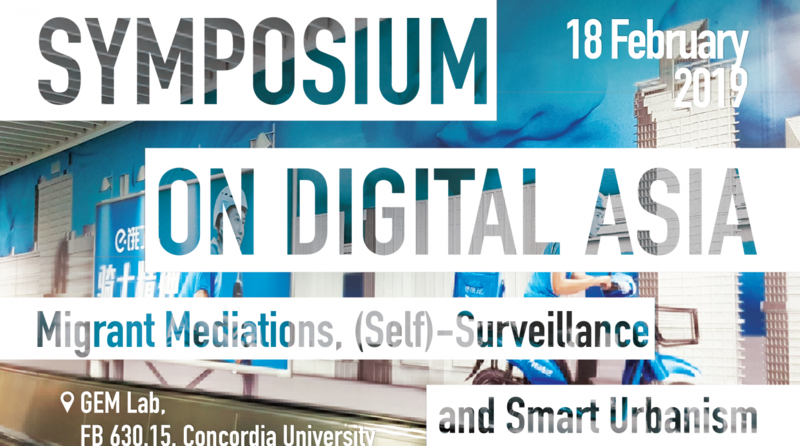 The symposium explores a wide range of digital forms and practices in China/Asia, with a particular focus on surveillance technologies, migrant media and mobilities, smart city initiatives, logistics, digital spectacle, and localization projects. Feng-Mei Heberer (NYU): Within the last decade, a noticeable wave of migrant labor-themed films has emerged on Asia’s cinematic landscape (and in fact the international cinematic landscape more broadly). These films have successfully circulated at international film festivals from Pusan to Cannes, reflecting as well a global media trend to show the dark side of globalization. Given this surge in media representations of migrant precarity, this paper pursues two questions: first, how do migrant workers engage digital media beyond the traditional screen, to tell their stories and make sense of their life abroad in ways that popular migrant worker discourse does not? Second, how can we broach the important issue of minority representation, and self-representation, without losing sight of the socio-technological and biopolitical economies that supersede human meaning-making processes? With a focus on the popularity of social media and, in particular, the selfie among Filipina workers in Taiwan, this talk examines how practices of online self-recording reflect on and participate in larger migrant regulations in the Asia Pacific. Feng-Mei Heberer is an Assistant Professor in the Department of Cinema Studies at New York University. Her research broadly engages the fields of transnational media, ethnic, feminist, and queer studies to explore the intersections of media, race, capital and migration. Her current book project examines transnational video works on Asian migration from parts of Western Europe, East Asia, and North America. With a focus on the mediation of a post-Cold War neoliberal reordering of minority subject formations, this study seeks to critically rethink “Global Asias” through feminist and queer of color critique. Her next project continues to explore Asian transnational media cultures with emphasis on the entwined concepts of digital labor and racial capital. Other interests include documentary and nonfiction media, film festivals, and practices of self-recording. Her writing has appeared among others in Sexualities and the edited volumes, Asian Video Cultures and The Autobiographical Turn in German Documentary and Experimental Film. Complementing her academic work, she has also been a film curator for several film festivals, including the Asian Film Festival Berlin. Weixian Pan (Concordia): In 2013, the Chinese Ministry of Housing and Urban-Rural Development issued the first list of 103 smart city test sites. Since then, smart experiments and technologies appear all over the country at different scales and forms. While we often understand them through glossy concept videos, government white papers, or proliferating digital infrastructures, the question remains: how is “smartness” distributed and experienced in different urban spaces, and for whom these experiments are designed? In this paper, I will examine the city of Shenzhen as a smart model not in the sense of its promise of an optimized techno-future, but primarily as a combination of media and social practices enacted by urban planners, designers, real-estate investors, migrant workers alike. Specifically, I will explore two examples: First, I look at how “Smart Longgang,” a model project supported by Huawei and the Municipal government, has been exhibited in media narratives and tied to the history of land reform since the 1980s. Second, I rethink the ways in which migrant workers position themselves in the smart urban economy, particularly through food delivery workers who actively use short video production (via mobile apps such as Kuaishou) to rebrand their precarious conditions into the “new chivalry.” By situating the broader discussion on smart urbanism, digital governance, and social surveillance within the geopolitical context of Southern China, this paper articulates different interfaces and temporalities between global digital media and urban life. Fan Yang is an Assistant Professor in the Department of Media and Communication Studies at the University of Maryland, Baltimore County (UMBC). Her research and teaching interests include cultural studies and globalization, media and communication in modern and contemporary China, urbanism and urban communication, and visual culture. She is also a faculty affiliate in the Asian Studies program and serves on the Global Studies Coordinating Committee. Yang is the author of Faked in China: Nation Branding, Counterfeit Culture, and Globalization (Indiana University Press, 2016). She is currently at work on a new project that examines the imaginary fusion of China and America in a growing number of transnational media artifacts. Yang’s work has appeared in Theory, Culture & Society, New Media & Society, positions: asia critique, Critical Studies in Media Communication, Journal of Asian American Studies, Quarterly Review of Film and Video, antiTHESIS, among others.